a tubular instrument that can be inserted into an artery either to draw blood or to measure blood pressure directly. More commonly referred to as an arterial line. A catheter inserted into an artery to measure pressure, remove blood, inject medication or radiographic contrast media, or perform an interventional radiological procedure. one through which a contrast medium is injected for visualization of the vascular system of an organ. Such catheters may have preformed ends to facilitate selective locating (as in a renal or coronary vessel) from a remote entry site. They may be named according to the site of entry and destination, such as femoral-renal and brachial-coronary. one inserted into an artery and utilized as part of a catheter-transducer-monitor system to continuously observe the blood pressure of critically ill patients. An arterial catheter also may be inserted for x-ray studies of the arterial system and for delivery of chemotherapeutic agents directly into the arterial supply of malignant tumors. a metal needle with flexible plastic 'wings' and a short length of tubing. The 'wings' assist in placement and facilitate fixation with tape. a long, fine catheter especially designed for passage, usually through a peripheral blood vessel, into the chambers of the heart under fluoroscopic control. See also cardiac catheterization. introduced intravenously under the direction of fluoroscopy, can be positioned in the right or left ventricle and an endocardial biopsy obtained. a long, fine catheter inserted into a vein for the purpose of administering through a large blood vessel parenteral fluids (as in parenteral nutrition), antibiotics and other therapeutic agents. This type of catheter is also used in the measurement of central venous pressure. See also central venous catheterization. an indwelling device for continuous peritoneal dialysis. It is implanted within the peritoneal cavity, resting against the body wall. 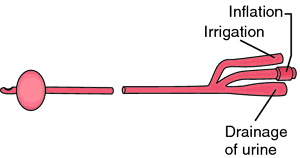 The attached Silastic tubing is used for infusing and draining the dialysate at intervals. 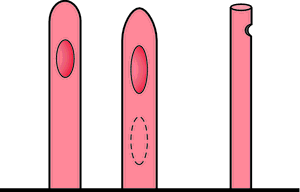 one having two channels; one for injection and one for removal of fluid. a catheter left in place to keep the bladder drained. Preferably should have a one-way valve to avoid aspiration of air and infection. a catheter bent at an angle near the beak. one especially designed so that it is held in place in the urethra for the purpose of draining urine from the bladder. a large-bore sharp needle housed with an indwelling stilette, inside a thin-walled plastic tube. An incision is made over the filled vein, the needle-cannula inserted, the stilette withdrawn, then the needle, leaving the plastic cannula in situ. one constructed to remain in the bladder, effecting constant drainage. the catheter is housed within the needle which is used to enter the blood vessel. After insertion, the needle may be removed by withdrawing, but leaving the catheter in place. A protective housing may be provided to cover the needle. one with small holes at the terminal 1 inch, especially designed for removal of secretions during tracheal suctioning. a long, extremely small gauge catheter designed for insertion directly into a ureter. any of various types of catheters designed for insertion via the urethra into the urinary bladder. See also catheterization. A Prospective Comparison of Ultrasound-guided and Blindly Placed Radial Arterial Catheters. The catheters included in this study were femoral central venous catheters, dialysis catheters, and arterial catheters for hemodynamic monitoring. Acid-base information obtained from blood gas samples taken from an indwelling arterial catheter appears to be the gold standard, (1) and is the method by which alternative methods (i. Gender disparity in failure rate for arterial catheter attempts. Normal saline is as effective as heparinised flush solution for keeping arterial catheters patent during and after surgery (Kulkarni et al 1994, Tuncali et al 2005, Whitta et al 2006). Heparinised saline or normal saline? Arterial catheter complications and management problems: observations from AACN's Thunder Project. The conclusion of the study, which will be published in the April 2004 edition of the American Journal of Emergency Medicine, stated that the Vasotrac monitor showed a very strong statistical correlation to an invasive arterial catheter. We did not find that poor damping characteristics were associated with the age of the arterial catheter or the type of catheter used. It is a technique very commonly used in critically ill patients in the intensive care units and approximately 8 million arterial catheters are placed yearly in the United States1. 5) The complications reported included accidental catheter removal, (6) vascular insufficiency, (2) infection, (1,2,5,6) circulatory impairment, (1) bleeding at the femoral arterial catheter site, (2) arterial occlusion, (5) neurological impairment, (1) vessel perforation, (1) local infection, (1,5) and clot formation in the catheter. The study will compare the Medwave Vasotrac Monitor to an invasive arterial catheter with patients undergoing various surgical procedures. The Vasotrac APM205A is reported to reduce the need for A-lines in patients that required an arterial catheter only for continuous blood pressure monitoring.